It’s no secret that The Legal Genealogist loves Black’s Law Dictionary. It’s a comprehensive dictionary of legal terms — many of them critical to the records we work with day in and day out — that gives new meaning to the concept of “Gold Standard.” Let me put it this way: if a legal term you’re trying to figure out isn’t in Black’s, then it’s probably spelled wrong. This one dictionary has been cited by the U.S. Supreme Court in hundreds of cases, the first time in 1901 for Black’s definition of “common law.”2 I wouldn’t even try to guess how many times it’s been cited in American courts overall — but the numbers would, I’m sure, run into the thousands. But it’s not the only game in town. And sometimes you just have to spend a little bit of time meandering through some of the other legal dictionaries that are out there to get a feel for the time and the place. You can find many copies of Jacob’s law dictionary digitized online, from the very first 1729 edition at Google Books to an American-published six-volume edition from 1811. And it’s fascinating reading, not just for legal terminology but because of the birds-eye view it provides into the lives and times of our British ancestors. 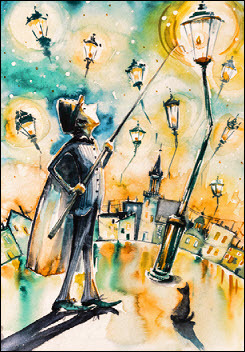 But where else are you going to find out that your city-dwelling London ancestor had to provide his own streetlights? For more than just legal terms.